In 2018, domestic pesticide industry will surely continue being impacted by policies and the market situation in 2017. According to CCM, in 2018, there are five main points that domestic pesticide industry should pay attention to. First of all, spot checks on the quality of agricultural products will continue being carried out in China in 2018. Also, special inspections will be conducted among pesticide producers and retailers. In addition, authorities will continue to organise the Production Safety Inspection Campaign in order to avoid significant production accidents. Companies should strengthen the supervision and management of the quality of pesticides. This includes to advance the establishment of pesticide traceability system, continue strictly follow the policy of designated retail of pesticides restricted for use, and enhance pesticide risk evaluation, conducting reassessment over the safety of pesticides that have been used for more than 15 years. According to officials, about a thousand trace standards of pesticides are to be formulated or revised. Meanwhile, companies might revoke the outdated standards which cannot fit in with the green development strategy; formulate or revise national or industrial standards regarding pesticide residue, technical specification, a rating of products, as well as utilisation of wastes. In addition, according to the Ministry of Agriculture of the People's Republic of China, the Regulations on the Prevention and Control of Crop Pests & Diseases is being underway, and the law is to be launched with the formulation of its supporting rules starting as soon as possible. What’s more, the planting structure of major crops is to be adjusted in China in 2018. According to the Ministry of Agriculture, the planting area of rice is to be reduced. This aims to achieve the goal that over 0.67 million ha can be reduced in 2018. The planting area of corn will also be reduced. As for wheat, the area will be greatly reduced in the over-development areas of groundwater in North China and Tarim River Basin; reduced in Northwest China where stripe rust usually originates from and in Jianghuai region where head blight easily occurs. In addition, more emphasis will be put on developing featured crops such as traditional Chinese medicinal materials, edible fungus, tea, fruits and food grains other than wheat and rice. Last but not least, promote the development of potato as a kind of staple food. By the year of 2020, the proportion of potatoes as the staple food in its total consumption is expected to increase to over 30%. Finally, the Zero Growth of Pesticide Usage Campaign will continue being carried out in China in 2018. This leads to the reduction of pesticide usage with green prevention and control methods. The government, therefore, is going to build some demonstration bases for the combination of united prevention and control and green prevention and control of pests and diseases, for the combination of honeybee pollination and green prevention and control technologies. All in all, China’s pesticides market will continue growing in 2018, driven by updated processing technology and market consolidation. Large enterprises will profit the most in 2018 and more pesticides are getting banned. Foreign traders of Chinese pesticides will face good opportunities to bring the products under trusted brand names to international markets and benefit from the growing demand worldwide. Leading enterprises in this industry are going to have more power in the market as environmental inspections and safety inspections become a normal routine in the foreseeable future. The main advantages of large pesticides enterprises are the self-sufficiency in raw materials and the resulting independence of market voluntarily, the implementation of new national standards for pesticides to fight fake and counterfeit products, as well as big overseas markets with growing demand and already existing clients. Get regular exclusive insights in China’s agrochemicals market by subscribing to our monthly newsletters. 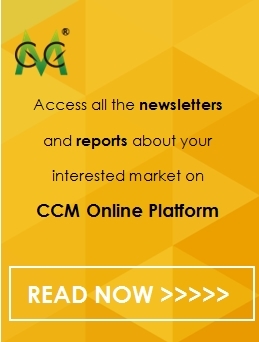 Try out our Online Database for free with access to all of CCM’s research resources of China’s agrochemicals market. Join the discussion by coming to our LinkedIn group and Facebook group.